Some babies sleep great from the day they are born, while others really struggle with sleep. Babies that are up all night and aren’t getting the sleep they need often need sleep teaching in order to sleep well. All babies know how to sleep, but not all babies know how to sleep well. That’s when sleep training comes in. And by sleep training I don’t mean cry it out. There are many different methods based on parenting styles that you can implement. 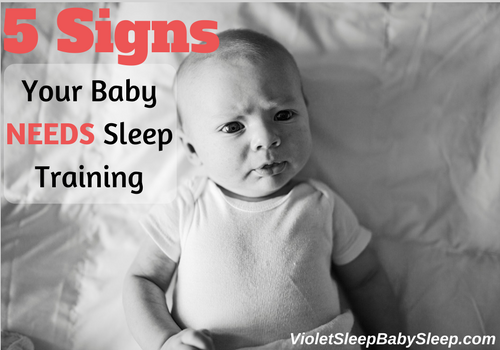 If your baby is exhibiting these signs below, chances are your baby needs sleep training. If your baby is waking frequently throughout the night, signaling you to come in and help him/her get back to sleep, this is a sign that your baby may need some sleep training. Fragmented sleep is not healthy. According to the National Sleep Foundation “sleep is especially important for children as it directly impacts physical and mental development. During the deep stages of sleep, blood supply to the muscles is increased, energy is restored, tissue growth and repair occur, and important hormones are released for growth and development”. If your baby is constantly waking he/she is not making it to those deep stages of sleep, or at least not enough of them. Frequent night wakings, requiring intervention are a good sign that your baby needs sleep training. If you are struggling getting your baby to sleep either at nap time, bedtime, during the night or all of the above, then this is a good indication that your baby needs sleep training. Sleep times should be calm, enjoyable and a great time to wind down and bond with your baby. If sleep times are anything but that and you find your self dreading or anxious about bedtime, then both you and your baby would benefit from sleep training. Sleep times should not be a mess, you should enjoy this special and relaxing time with your baby. You should be able to follow a simple routine, lay your baby down and he/she peacefully drifts to sleep. If this is not the case, then we should chat. I would be glad to help your baby or toddler sleep well! My methods have an almost 100% success rate. I always consider your child’s unique situation when creating a sleep plan to ensure the plan is the right one for you and your baby. Whether you are a parent that can tolerate some tears, or one that cannot stand any tears at all, I can help! If you follow my blog, you know that sleep props are the number #1 culprit to sleep troubles. As a matter of fact over 95% of my clients have troubles with getting their baby to sleep well because sleep props such as rocking, feeding, bouncing, etc are keeping their baby up. Here’s the thing with sleep props. They aren’t always bad. Nursing or rocking to sleep is only “bad” when it is causing sleep troubles and your baby is not getting the sleep her growing body needs. Some babies fall asleep while being fed or rocked and sleep perfectly fine all night. This is NOT a problem. Continue feeding and rocking your baby to sleep if you enjoy it. But other babies (many of them) are sensitive to props, meaning when they fall asleep with a feeding or while being rocked, they expect the same after a sleep cycle or two. Since babies have short sleep cycles, this causes frequent night wakings. So if your baby needs a prop to go to sleep, or even just during the night, and this is disrupting his/her sleep, then your baby definitely needs some sleep training. If your baby is often cranky, fussy, and does not enjoy playing, this may be a sign that he is overtired and not getting enough sleep. Babies that wake frequently throughout the night are usually quite miserable during the day. Fun things like playtime and practicing milestones are usually not fun for tired babies. And they aren’t fun for you as a parent either. Instead of having fun, playing games, helping your baby learn new skills, you are constantly trying to calm your fussy baby. This is a good sign, and a very good reason to sleep train your baby. A baby that is overtired may also be hyper or seem “wired”. When a child is not getting enough sleep, his body makes more cortisol and adrenaline so that he can stay awake. These are stimulant hormones. 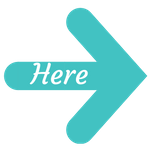 The same hormones produced during stress, or during a flight or fight response. An overtired child may seem very energetic, won’t sit still, may even be aggressive, and will certainly have a difficult time settling for bed. An overtired child often mimics a child with ADHD. As a matter of fact there was a study conducted on the misdiagnosis of ADHD. Children who were often diagnosed with ADHD, when in fact they were just lacking proper sleep. Once the sleep improved, the ADHD symptoms were gone. You can read more about that study here. If your baby is not sleeping well and is often hyperactive, this is a good reason to investigate this behavior some more and start instilling some good sleep habits. When it comes to sleep training parents often get confused. They don’t know where to start, they are afraid of too many tears, and often feel they can’t be helped. Don’t let these misconceptions stop you from helping your baby get the sleep he desperately needs as he’s growing and developing. And the sleep you need in order to happily parent and enjoy your baby. I promise you can get your baby sleeping well and fast, without the need to resort to cry it out. It’s all about teaching good sleep habits and using a method appropriate for YOUR child. If you enjoyed this article please share it! And as always leave me your questions or comment below. I have a 6 month old little girl who is exclusively breastfed. She doesn’t take a bottle and I don’t supplement with formula. I recently just introduced rice cereal with my milk before bedtime since I’ve been told it helps keep babies fuller at night, but I am curious if sleep training a breastfed baby is healthy and well, possible. My little girl sleeps in the same room as her father and I in a rock n play sleeper. She has had a bedtime routine since she was a month old and is familiar with day and night. It’s keeping her asleep without having to stay in the room and rocking her when she is startled by a sound or a movement of hers. I believe she might also be teething as well. I understand breastfed babies do not sleep through the night without feedings which I am not concerned about, I just want her to be able to fall asleep at night for as long as she needs until her next feeding and then fall back asleep until the next one without a fuss or having to be rocked again. We are desperate here since we also have a 6 year old who is up at 6am every morning for school and my boyfriend is also a teacher. So sleep is very needed for our family. Thank you for your help and for sharing your knowledge on sleep training with the rest of us! My 7 month old baby starting sleeping through the night for a few weeks, now wakes every 20 mins, im exhausted! Getting him to sleep is not a problem, it staying asleep.